Surface (Rayleigh-waves) and leaky-Rayleigh waves are widely used in acoustic microscopy to characterize different materials and thin surface films and coatings. Much less is reported about the application of the same wave types in the low-frequency range. However, the same theoretical background and principles on which the high-frequency acoustic lenses are based can be utilized in low-frequency immersion and contact transducers. The application of low-frequency (2-12 MHz) transducers used for creating Rayleigh and leaky-Rayleigh-waves on the surface of a material are descibed here. Figure 1a shows the incident pulse as originating at a highly focused lens which is used both as transmitter and receiver. Fig 1: Principle of measurement with low-frequency wide-aperture transducers. The pulse is incident perpendicular to the surface. A ray emerging from the lens at the critical angle for surface wave generation and hitting the surface at point (2) will generate a leaky surface wave.As this surface wave propagates, it will generate a compression wave in the fluid which emerges at the critical angle. Depending on the propagation velocity of ultrasonic waves in material (V 2 ) different time-of-flights (t) will be seen on the screen as shown in Fig.1b. Possible cracks opening to the surface or lying slightly below the surface will be detected based onthe disappearance of signal of leaky-Rayleigh-waves (Fig. 1c). 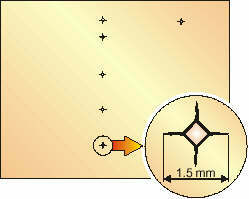 All the transducers described here are focussed in two directions as shown in Fig.2a in order to create a line focus on the surface of the material. First transducers have been constructed by VTT;later on transducers have been designed by VTT and manufactured in cooperation with Fraunhofer Institute for Nondestructive Testing (Germany) and Imasonic (France). 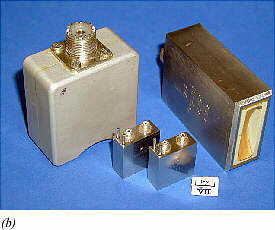 The larger transducers shown in Fig.2b are used in immersion and the smaller ones in contact. Fig 2: Principle of construction of low-frequency wide-aperture transducers. 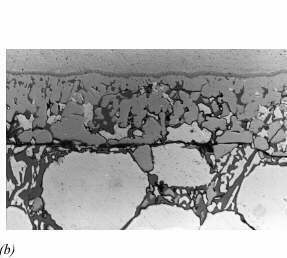 The result of transducer characterization performed by utilizing an alumina plate containing indentations made with a Vickers hardness tester is shown in Fig. 3. The dimensions of the beam are estimated to be 1 x 4 mm (width x length). The penetration depth is approximatelly l.
Fig 3: (a) Drawing showing the alumina plate (20 x 30 mm) used for characterization of the beam. The positions and type of the 6 indentations made with the Vickers hardness tester are shown. (b) Ultrasonic C-scan image demonstrating the dimensions of the beam on the surface of the plate. The measurements shown here have been performed by using the mechanised scanning system manufactured by Ultrasonic Sciences Ltd. (UK) and the ultrasonic SUMIAD system manufactured by Tecnatom (Spain). In addition, ultrasonic C-mode scanning acoustic microscope manufactured by Ultrasonic Sciences Ltd. has been used in the measurement shown in Fig. 6. 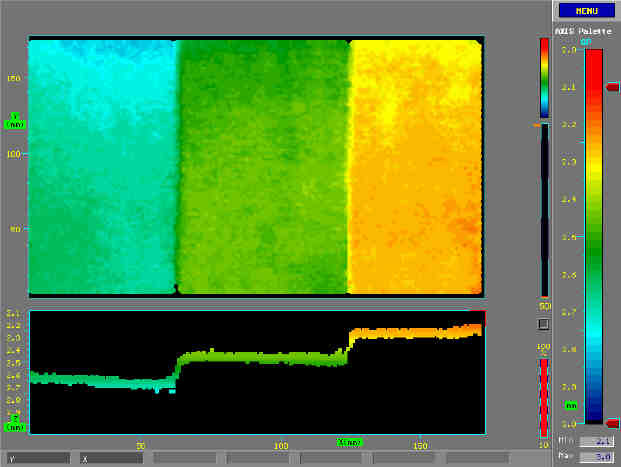 Fig 4: (a) Time-of-flight C-scan image of a stainless steel block coated with layers (600, 400 and 200 mm) of thermally sprayed alumina. The image shows the relative sound velocities in the coating. (b) The velocity in the substrate affects the velocity measured on the surface of the coating. The same principle can be used to measure the variations in the velocities of Rayleigh-waves which correlate e.g. with the porosity and density of the material. The measurements shown in Fig. 5 (b) and (c) have been performed by using the contact transducers shown in Fig. 2b. Fig 5: (a) A gas turbine blade containing electrodischarged notches of various depths. 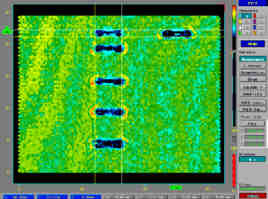 (b) Ultrasonic B-scan image of the blade measured in pitch-and-catch mode. 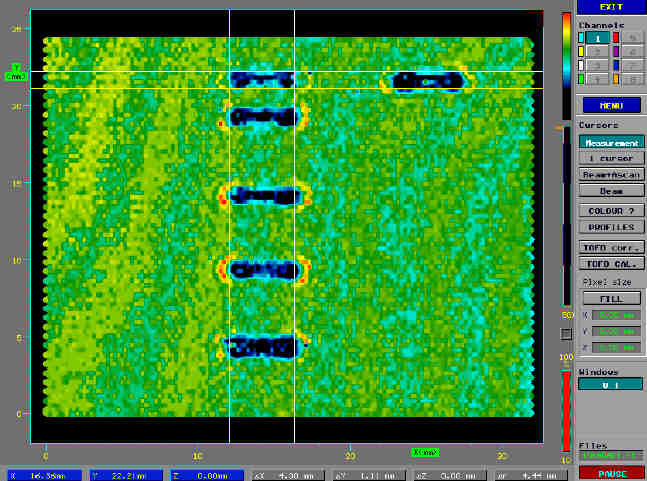 (c) Ultrasonic B-scan image of the same blade measured with the same transducer in pulse-echo mode. Fig 6: (a) Small scale prototype of ITER (International Thermonuclear Experimental Reactor) first wall after thermal fatigue test at 5 MWm 2 heat flux for 1000 cycles with 15 seconds dwell time. 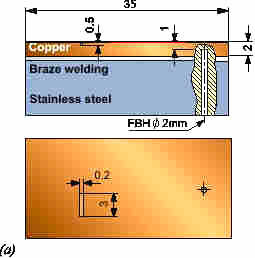 (b) Cross section of the copper layer showing cracks initiated from the copper surface. Ultrasonic C-scan images of the copper interface before (c) and after (d) the high heat flux test. Fig 7: (a) Test block containing a 0,5 mm deep artificial defect and (b) a laminar disbonding. 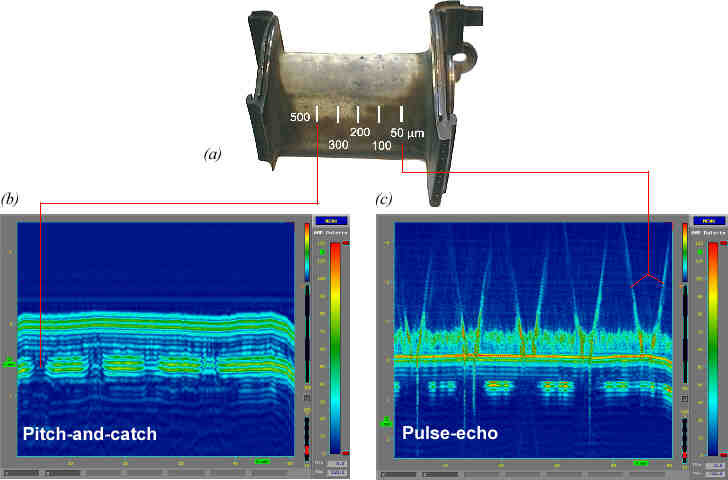 (c) Detection of surface opening defects by monitoring the leaky-Rayleigh wave. (d) Disbonding of the brazing shown in the C-scan image produced with longitudinal waves. By proper design of the transducer both laminar defects and surface defects can be detected with the same transducer.